I was thrilled! 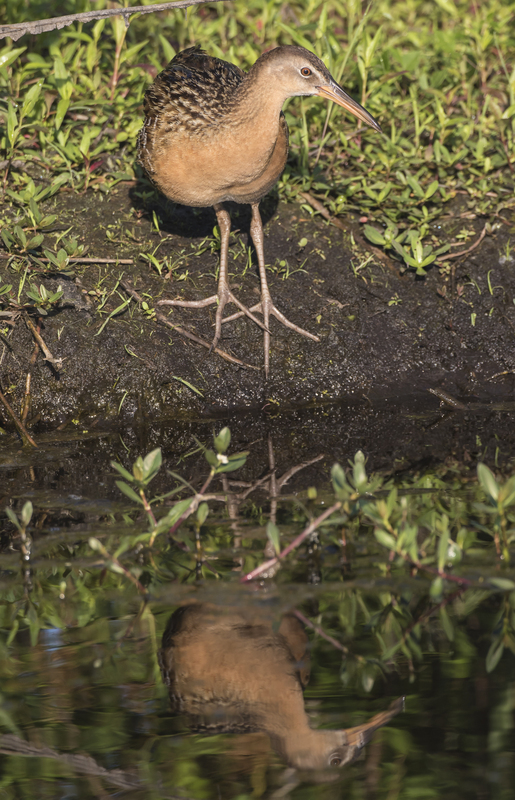 I had only seen adult King Rails, and only three times over my many years of traipsing these haunts. 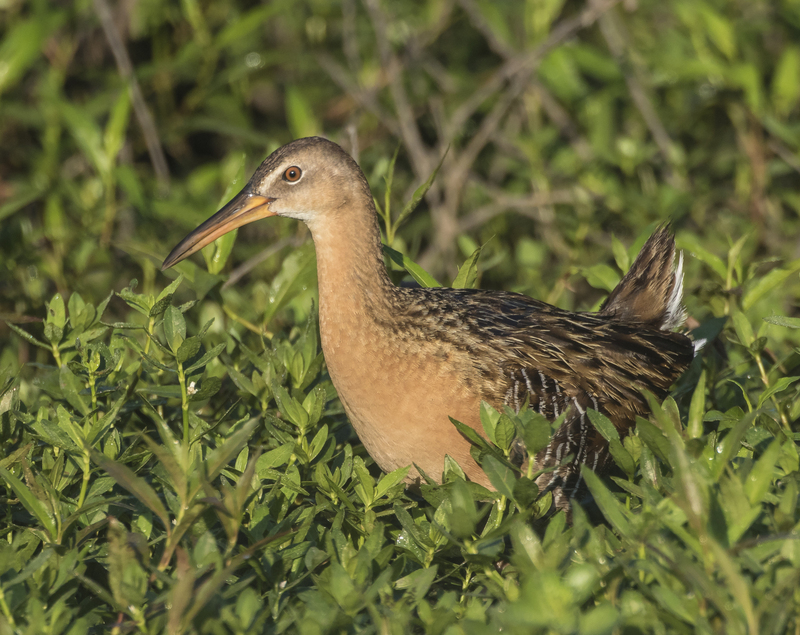 I had heard their distinctive calls on many trips, but they tend to be an elusive critter and blend in very well in the dense vegetation of their marshy homes. The little one quickly disappeared, probably trailing its mom. I moved the car toward the edge of the canal, hoping to see the birds if they crossed. 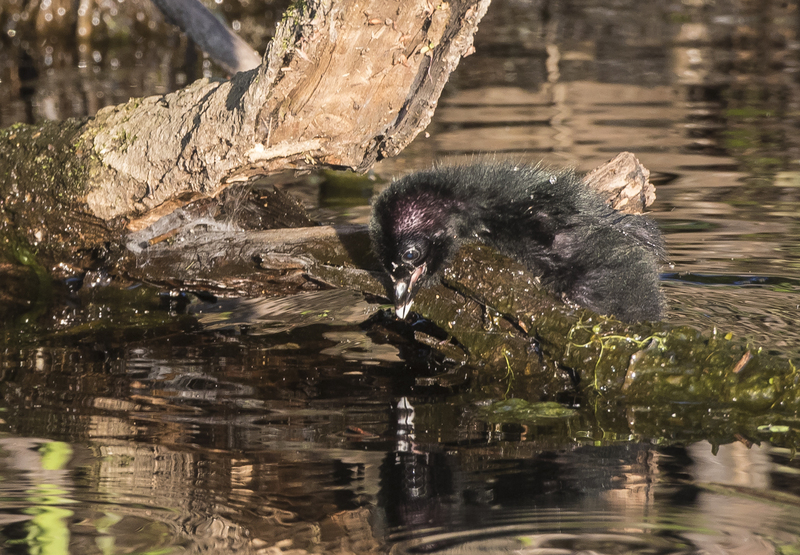 She suddenly appeared on a log sticking out into the canal, turning briefly to look back toward where the young bird had been, then walking across and onto the far bank. I looked up from the camera, and saw five tiny black forms swimming across the canal, all partially obscured by some tall grasses. There was another rail, just across the canal from me. This one was just threading its way through the vegetation along the canal, probing and feeding. 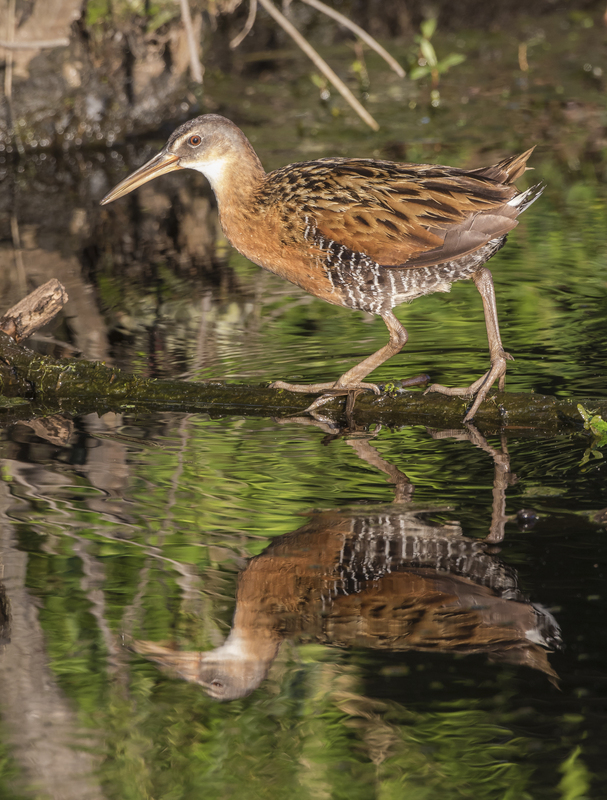 King rails feed on a variety of invertebrates including aquatic insects, crayfish, and other small critters like frogs and fish. I ended up spending quite a bit of time following this bird as it moved back and forth along the canal bank, seemingly unconcerned about the car inching along on the opposite bank. This was when another vehicle pulled up, realized I was watching “just a bird” and drove off. I reported on what I saw when I turned back around to look at the rail in an earlier post. On two occasions, the rail stopped to stretch and preen. 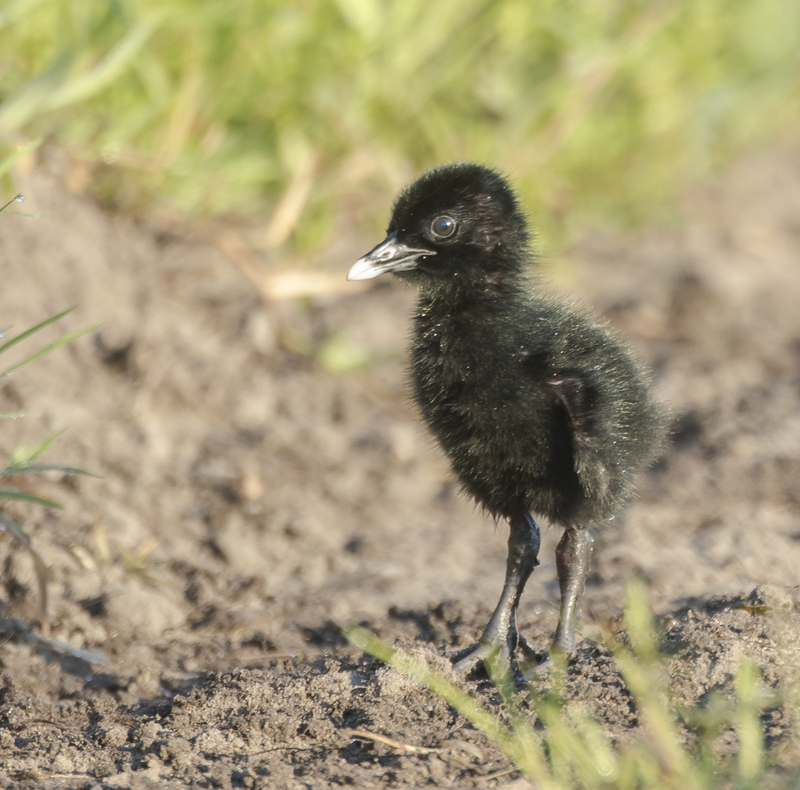 At one point it came out onto a mud bank where its huge feet were clearly visible, a great adaptation for walking on the top of marsh vegetation. But, the highlight for me was when the rail let loose with its distinctive, harsh and loud kik-kik-kik call. As I mentioned, I have heard this call many times and tried more often than I can count to find the caller, and here was on out in the open, with just me as an observer. Life is good! 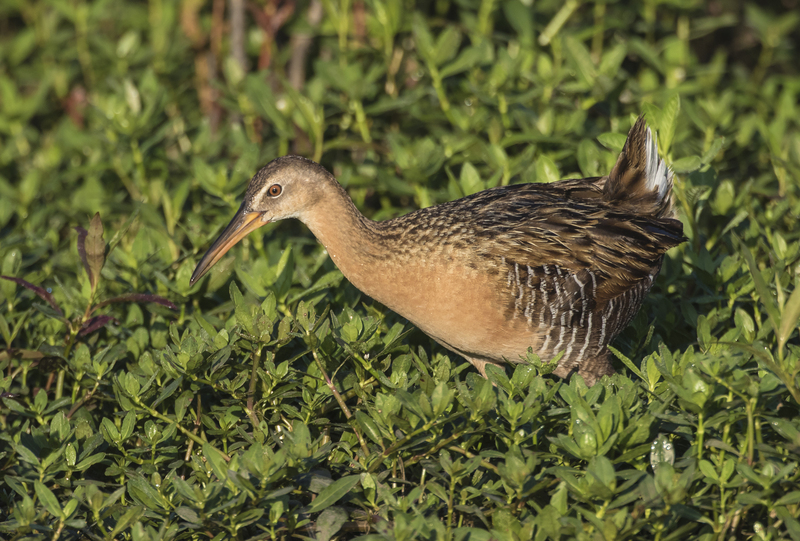 This entry was posted in Natural History, Trip report and tagged king rail, pocosin lakes national wildlife refuge by roadsendnaturalist. Bookmark the permalink. 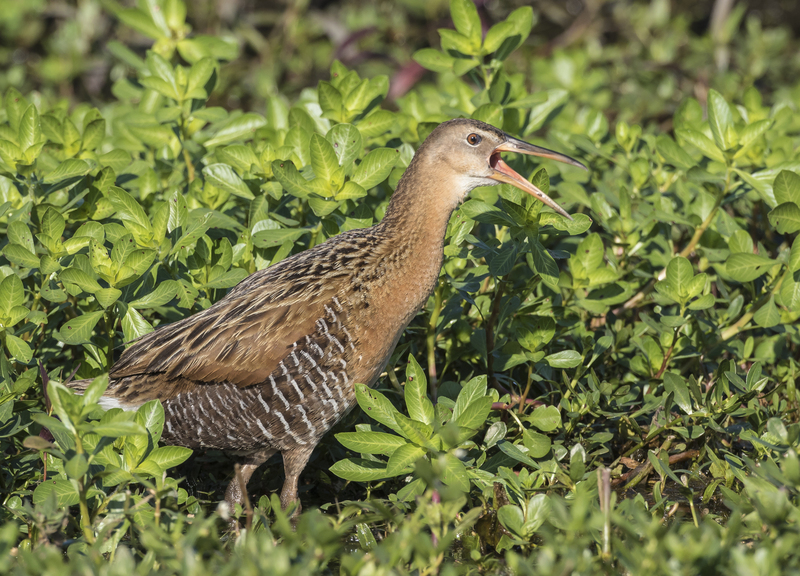 So is Audubon’s Fresh-water Marsh Hen now our King Rail, or another species? Just curious…. That is another name once used for this same species. Thanks, Wendy. A lucky day, for sure.